Recently we went on a road trip to Hamilton County, Indiana which is just north of Indianapolis. We were quite impressed with the amount of craft breweries in Hamilton County and we did our best to stop by as many as time allowed on our trip! Hamilton County, Indiana is comprised of many small towns, but none of the cities seem to far from each other, and traffic was not a problem, so we were able to take in quite a few sights and visit many different places in just two days. We love hanging out at breweries and playing games with the kids while tasting locally brewed craft beers. It’s a great way to get a taste of several different beers in one sitting. While we managed to visit several breweries on our trip, there’s still plenty more to visit, so we are going to have plan another trip to Hamilton County…maybe a weekend getaway for just the parents! Our first planned activity in Hamilton County was rained out so we needed to take a break to figure out a new game plan. 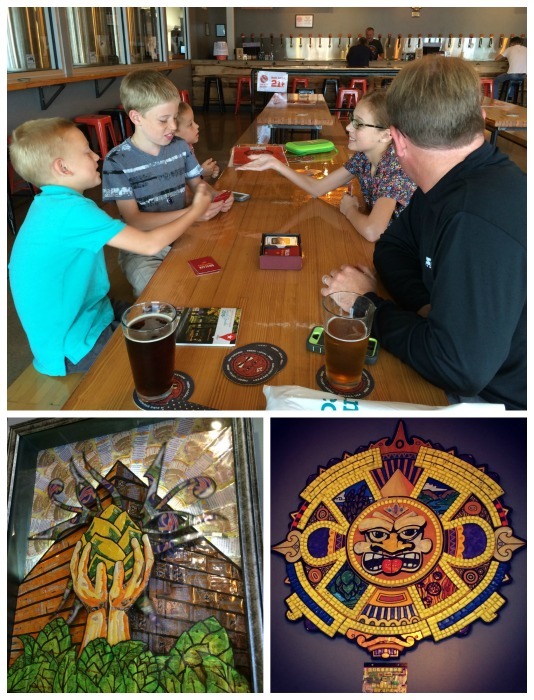 We headed to Sun King Tap Room in Fishers, Indiana to play a game with the kids while we went through the travel guide to decide on our next stop. The Sun King Tap Room was a really cool hangout. There was some awesome art adorning the walls from local artists (made from reclaimed materials like beer cans). The service was super friendly, the space was huge, open and clean. And of course there was the obligatory big window to view the brewery. We found ourselves hungry in the middle of the afternoon while exploring Hamilton County. We had already had lunch, and it was too early for dinner so we decided to make a pit stop for snacks and beverages. 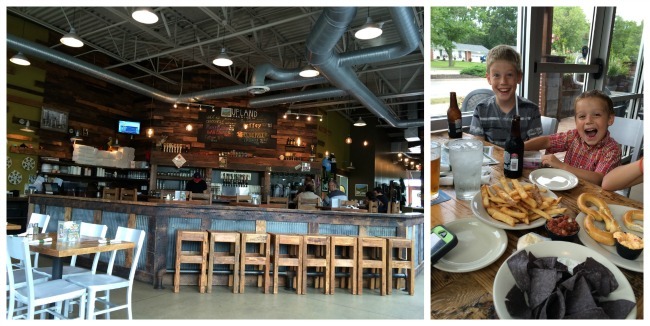 We checked out our handy food and travel guides from Hamilton County and ended up at the Upland Brewing Company‘s Carmel Tap House. While the Carmel Tap House is not technically a brewery they do serve local craft beer from Upland Brewing Compnay, and have a great ever changing menu. We opted for some kid friendly snacks like soft pretzels and fries with root beer for the kids and brews for the parents. Bad Elmer’s Porter was my fave! 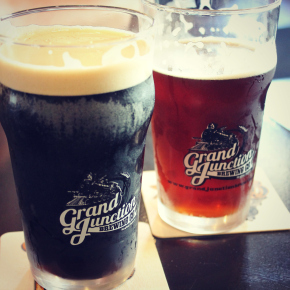 If I had to pick a favorite of the breweries that we visited in Hamilton it would be Grand Junction Brewing Company and not because of the beer. Don’t get me wrong, I loved the beer (ohhhhh that porter! )…but their Pork Tenderloin sandwich is what makes me keep thinking about this place. This was our first Pork Tenderloin sandwich, and we were both wowed by it. 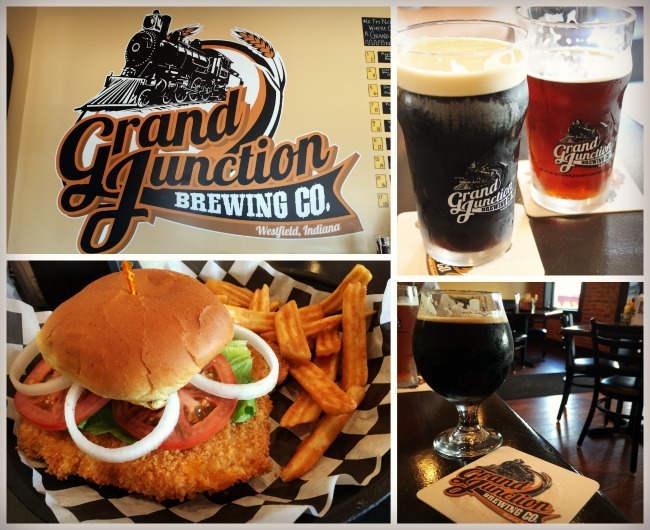 Hamilton County has a “Tenderloin Trail” where you can try different sandwiches all over the county, so I think next time we visit the area we’ll have to try another sandwich but I can’t imagine one being better than the one we had at Grand Junction. Planning a trip to Hamilton County, Indiana? Check out Visit Hamilton County for ideas on where to go, what to eat and what to see!